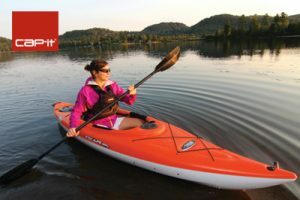 Franchisor of the Cap-it Genuine Truckware chain of stores, announces the addition of Pelican Kayaks to its growing line of Adventure Products. Scheduled for release in March of 2016, Kayaks will compliment Cap-it’s Waterline Series of inflatable boats to further service the growing number of outdoor water-sports enthusiasts. Pelican International, a Canadian company based in Laval, QC, is a world leader in the design and manufacture of kayaks, canoes, pedal boats and fishing boats. For over 45 years they have leveraged their mastery of thermoforming to deliver durable, quality products at affordable prices. A commitment to innovation, investment in state of the art technology and rigorous quality control standards are the cornerstones of their business philosophy. Their guiding principal is simple and enduring: to bring quality products within reach of all outdoor enthusiasts. Pelican Kayaks feature RAM-X, a multi-layer material exclusive to Pelican. It is known for its high impact-resistance, its ability to regain its initial shape after violent impacts and its UV-protected exterior finish. RAM-X has become the benchmark of quality in the industry. Liberty 100X Kayak – Beginner / Intermediate 10′ sit-in Kayak with twin-arched multi-chine hull. Since 1990, Cap-it Genuine Truckware has established itself as an upscale retailer of quality truck accessories and recreational adventure products. Because Life’s an Adventure, our 26 stores across Canada from Vancouver Island to Newfoundland provide our customers lifestyle solutions for their vehicles for work and recreation.